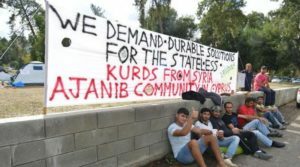 As of Monday, 14 May 2018, the stateless Kurds from Syria are staging as yet another hunger strike, extended as from today, 21 May, to a thirst strike, in protest against the continuing refusal of the Ministry of Interior to recognise them as refugees and grant them citizenship. 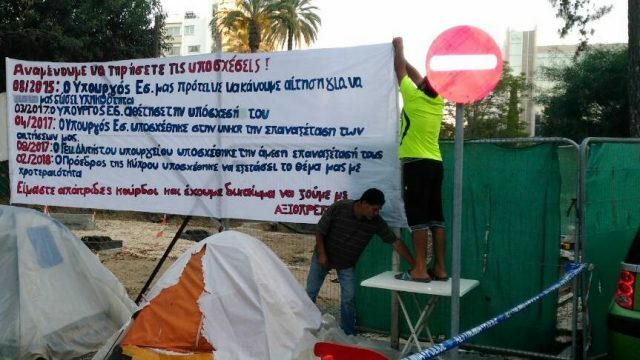 The refugee family have been in protest, living in tents, outside the Presidential Palace and the Ministry of Interior for 15 months. 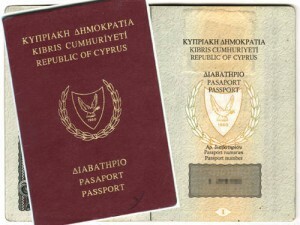 The refugee are Ajanib (stateless Kurds from Syria), living in Cyprus since 2006 (you can find here a document with the main stages of the protest). 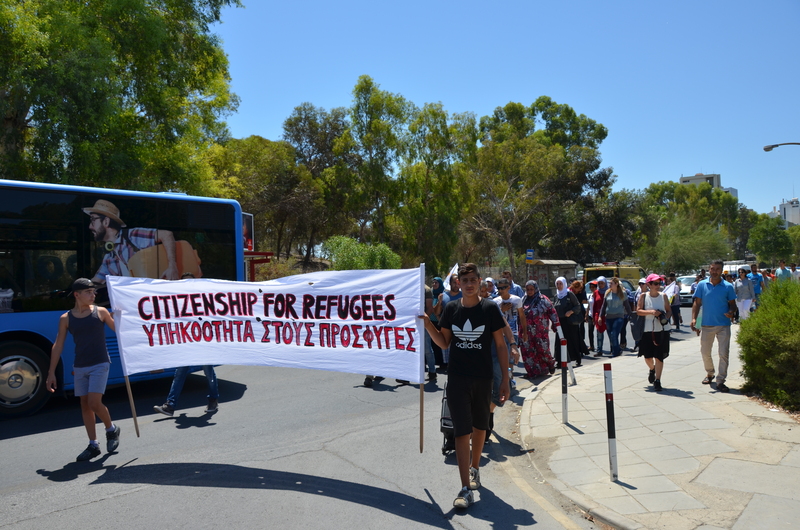 As a result of the Cypriot authorities’ unwillingness to grant them full refugee status, since 2014 they mounted a number of protests, staged outside the Ministry of Interior and subsequently outside the Presidential Palace as well. Their first protest from October 2014 to August 2015, along with other Kurdish refugees, ended when one family member was granted Cypriot citizenship and the Minister of Interior proposed that the remaining family members submitted citizenship applications one year from then, when they would meet the residence time requirements for citizenship. Although these applications were submitted as required, on 27/3/2017, the Ministry of Interior rejected them collectively rather than individually as provided by national and international legal instruments, on totally unjustified and arbitrary grounds. 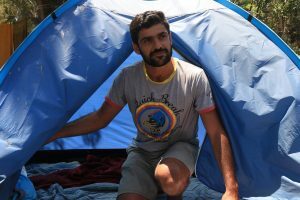 At the same time, however, the Ministry admitted that the family were “in effect enclaved, without passports and without any perspective for better conditions”. As conveyed to the family by the UNHCR, the former Minister of Interior admitted to the UNHCR Director that this decision had been incorrect and he had given directions for the review of the applications. As the present Minister of Interior refused to take on his predecessor’s pledge, on 7 April 2017, the family was inevitably led to as yet another protest, this time outside the Presidential Palace, appealing for the President’s intervention. 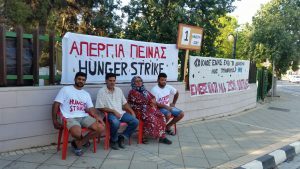 On 6 June 2017, their protest escalated with a 67-day hunger strike by two family members, which was suspended on 11 August 2017 as a sign of good will in response to promises of the Permanent Secretary of the Ministry of Interior that their applications would be reviewed. However, ten months afterwards, these promises are still not realised and the Minister of Interior maintains his intransigence and is in effect punishing the family for exercising their inalienable and legally protected rights to peaceful assembly and protest. The Minister actually stated that “their protest constitutes an abuse of Cyprus’ democratic system [and] … if they protested in their country they would be have been killed”! 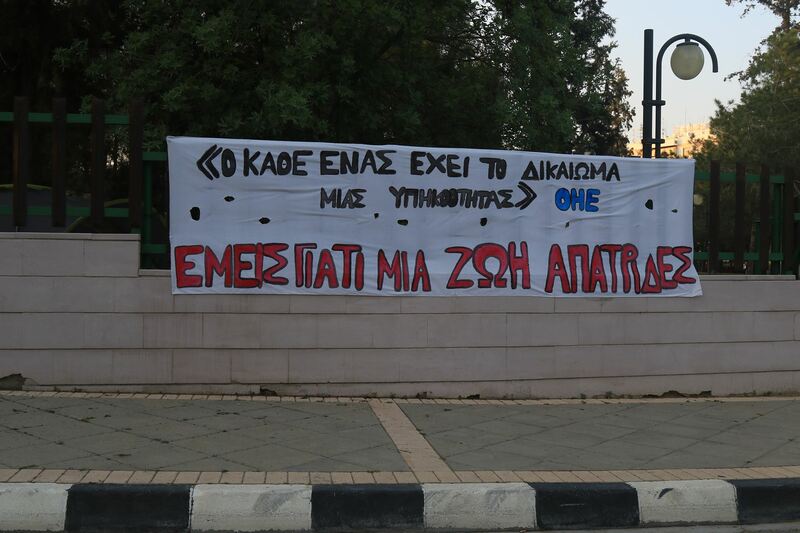 And this, despite the support lent to the family’s claims and the solidarity with the protesting family by various bodies and agencies, such as the Chair of the Parliamentary Committee on Internal Affairs, the Commissioner for Children’s Rights, the UNHCR in Cyprus, national NGOs and political parties, as well as society at large. 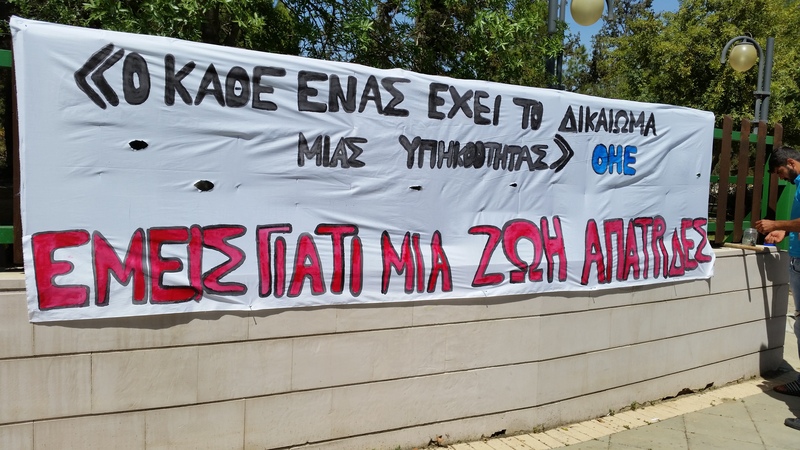 Despite the latest positive developments, KISA thinks that it is very important to continue the pressure on the Cypriot authorities and for this reason, we suggest to endorse and send the appeal that you will find below to the Cypriot authorities. 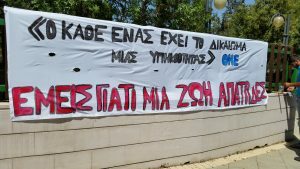 Here is the appeal letters of support ( Greek and English) that each organization can fill out and send it to the authorities mentioned in the letters either by email or fax. KISA-Action for Equality, Support, Anti-Racism is pleased to announce that the struggle of the stateless Kurd’s from Syria, who had been camping in front of the Interior Ministry since October 2014 , has produced a positive outcome. 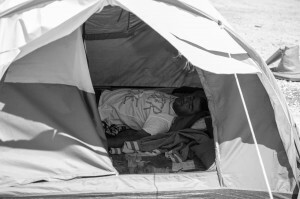 The refugees’ protest lasted 10 months, and during that time the protestors started a hunger strike that lasted 58 whole days and refused to take on any liquids for 5 days. 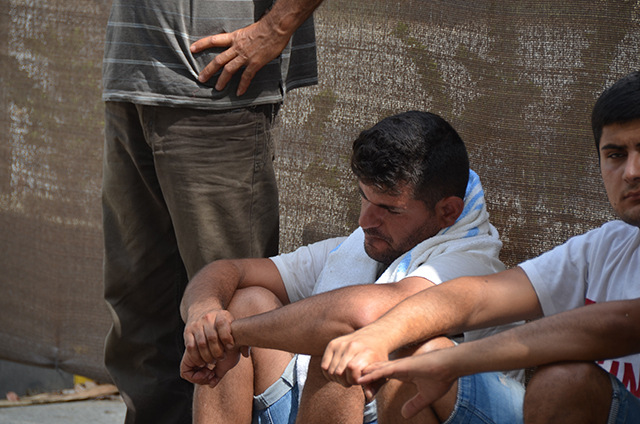 On 22.05.2015, the stateless Kurds have applied for citizenship following the recommendations of the General Director of the Ministry and the Minister of Interior. 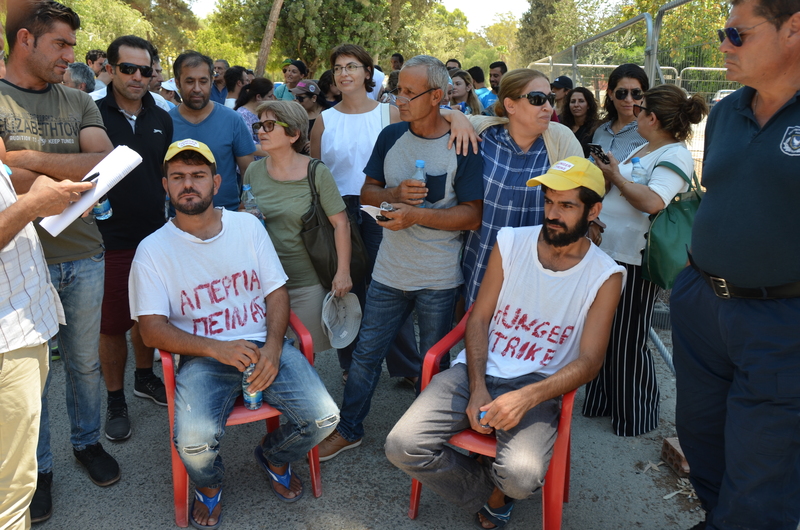 In the afternoon, the Minister of Interior, visited the strikers and assured them that the Ministry will examine their citizenship applications during the coming week. After this development, the strikers decided to stop the thirst strike while they are determined to continue the hunger strike until there is a positive outcome to their demands. 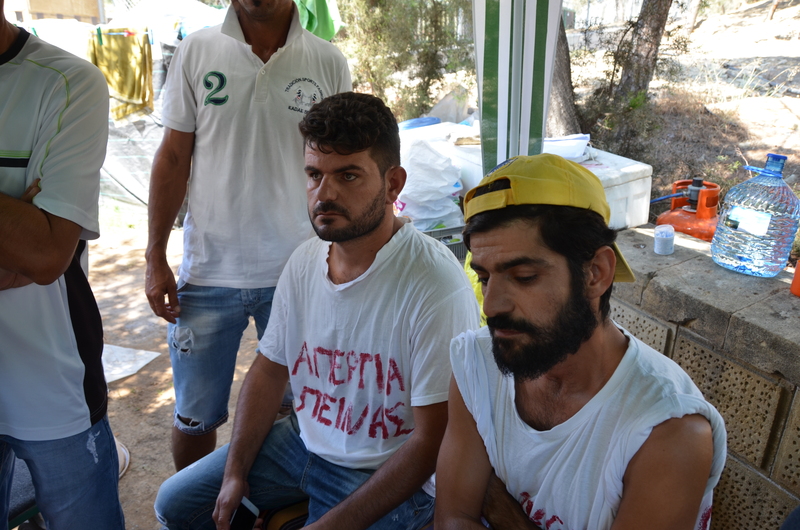 On 22.05.2015, a doctor of the Red Cross, visited and examined the strikers today. According to the medical diagnosis, the health status of the first striker is critical while the health status of the second has shown very serious complications. 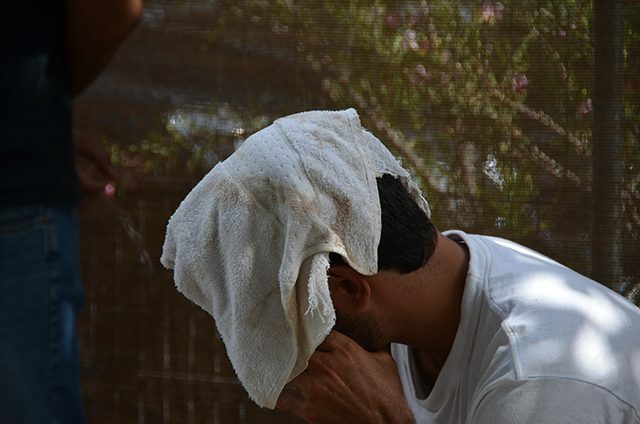 The doctor assessed that if they continue the hunger and thirst strike for one more day then the damage that will be caused to both refugees will be irreversible. On 19.05.2015, the stateless Kurds from Syria entered the second day of a thirst strike and the 23rd day of a hunger strike. The condition of their health remains stable despite the obvious consequences of the strike on their health. 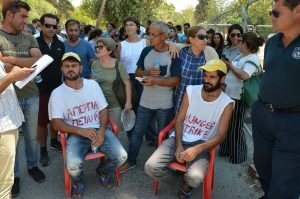 In view of these developments, today, the General Director of the Interior Ministry visited the strikers and expressed the desire of the Ministry for not causing any further negative effects on the health of the strikers and assured that efforts for finding a solution to their problems are in progress. KISA Press Release A solidarity event with the stateless Kurds from Syria was successfully held on 14/5/2014, outside the House of Representatives. 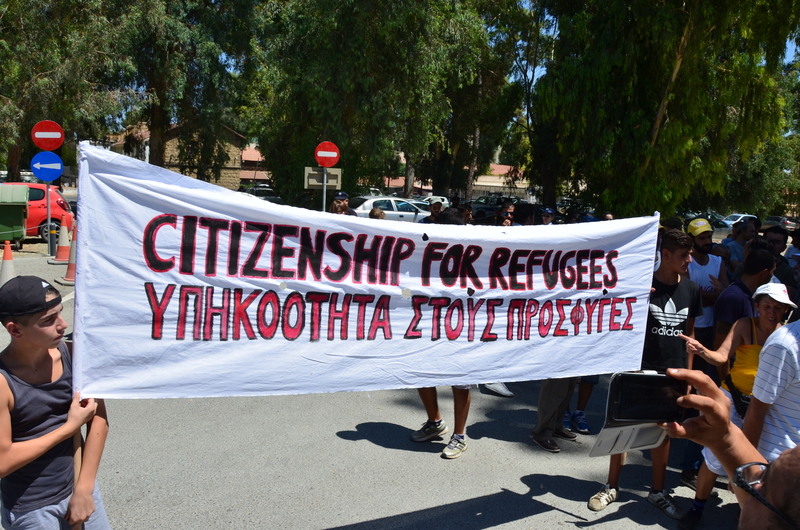 The refugees are asking the authorities to grant them the recognized refugee status instead of the subsidiary protection status. 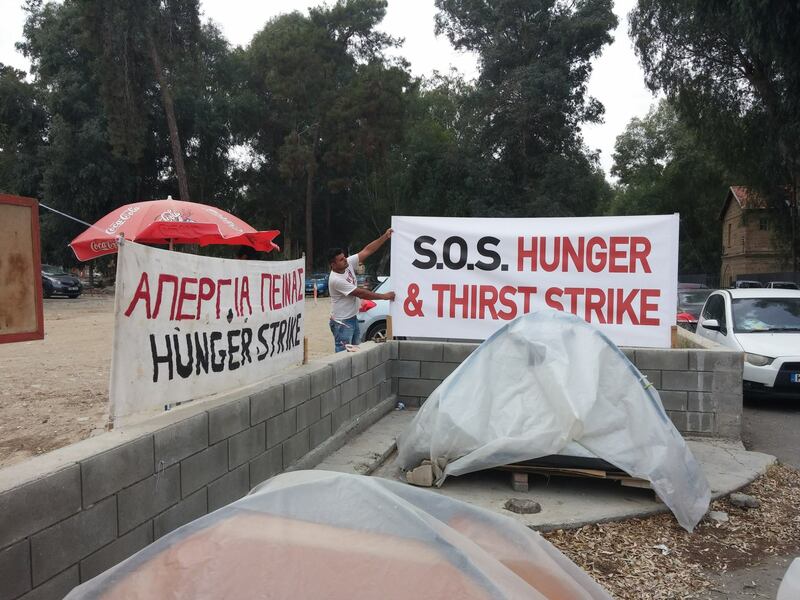 During the event, a delegation of NGOs that support the struggle of the strikers, together with the strikers themselves, met the Director General of the Parliament and delivered a joint statement, whereby they call on the Parliament to support the struggle of the refugees. 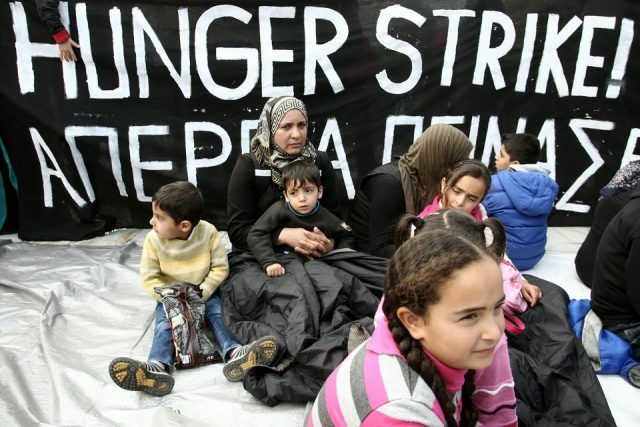 Two Kurdish refugees from Syria (Ajanib), decided to go on a hunger strike, having first exhausted all the means they had at their disposal to persuade the Ministry of Interior (MoI), to re- examine its original decision and to grant them the recognized refugee status. 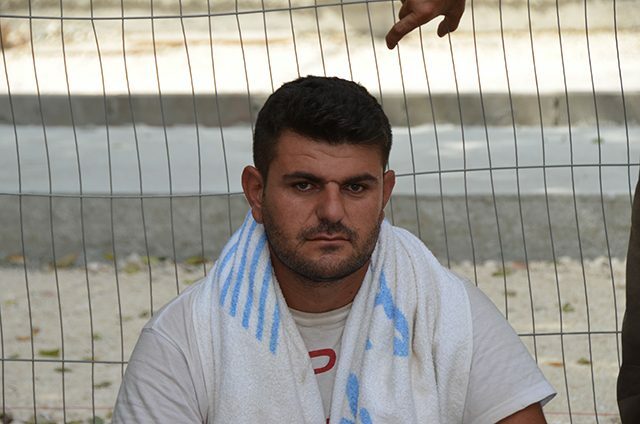 Ten years ago, in August 2005, the two refugees, were forced to leave from Syria because they were persecuted by the Assad regime and because of the continuous violations of our human rights that are suffered by all Ajanib Kurds in Syria. In October 2014, they went on a strike in front of the Ministry of Interior with other Ajanib Kurds from Syria, in order to pressure the Cypriot government to proceed with the examination of our asylum applications. 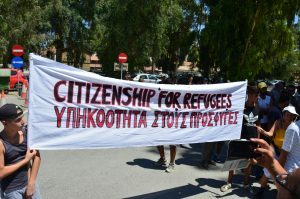 In December 2014, they received the decision of the Refugee Reviewing Authority to grant them the subsidiary protection status. it deprives the right to family reunification. 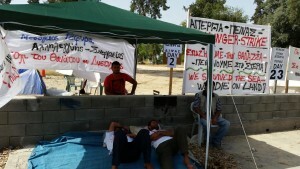 The hunger strike, as a form of struggle, aims, on the one hand, to inform the public about the refusal of the MoI to grant them the recognized refugee status and, on the other, to press the Cypriot state to meet its responsibilities as it continues to refuse to fulfill its obligations, despite the fact that these people meet all the statutory requirements for granting the specific status. 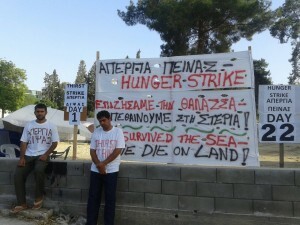 The hunger strike and the demands of the strikers are getting much publicity both internationally and locally. 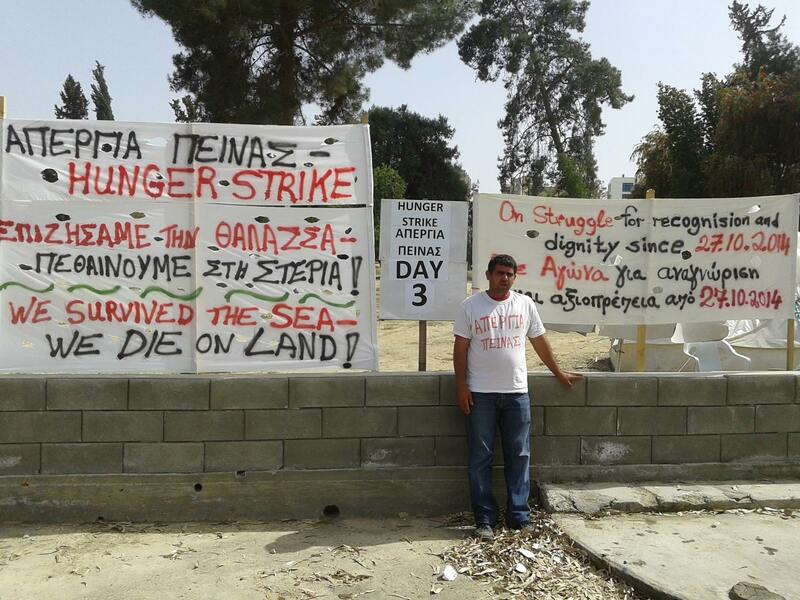 The Al Jazeera English published on its account on YouTube an interview of the refugees who are on strike. In this interview, which took place at the premises of the Ministry of Interior, the refugees say among other things that the subsidiary protection status that they have been granted by the authorities condemns them to precarity. The Cyprus Mail produced a video (will be published soon) with the hunger strikers in which they are talking about their situation and their demands and explaining the reasons they are on hunger strike. Simerini published an article headed “Kurdish Ajanibs on Hunger Strike”. (Simerini. pp 11- 04.05.2015) . Simerini about the solidarity event.